Slice into thirty-two tales filled with ninjas, vampires, aliens, bed bugs, giant rats, gargoyles, gorgonzola cheese, and other horrors. 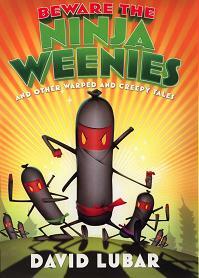 You'll find stories about everything from video games to ant-frying bullies. Learn the disadvantages of a brilliant smile, the advantages of frozen hair, and the dangers of blood-thirsty catfish.